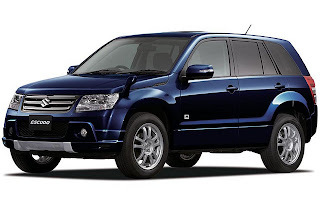 India's largest car maker Maruti Suzuki India recently launched its new Maruti Grand Vitara 2.4. Grand Vitara 2.4 launched in two variants- Grand Vitara 2.4 Manual, Grand Vitara 2.4 Automatic.These variants are priced at Rs. 16.67 lakh and 17,97 lakh for manual and automatic transmission respectively. This revamped sports utility vehicle (SUV) is completely built unit (CBU) import. It suggests that the vehicle is imported from Japan. The main features of the SUV are All-time, 4-mode, 4-Wheel Drive (4WD), rear disc brakes, multi information display, 6-CD changer etc. The company worked hard to give it a stylish look too. The muscular vehicle is launched with no pomp and show. The power machine sports a 2.4 liter, DOHC petrol engine with a displacement of 2397cc, VVT. The powertrain churns a maximum power of 163.5 bhp at 6000 rpm and develops maximum torque of 220 NM at 4000 rpm. The model comes in two variants-5 speed manual transmission and 4 speed automatic transmission. The SUV is fitted with rear disc brakes and front drum brakes. It rides on McPherson strut front suspension and multi-link rear suspension, which soak up the impact of bumps and road irregularities, thereby giving a smooth ride. It comes equipped with front and rear disc brakes. As far as the suspensions are concerned, the vehicle comes with McPherson strut front suspension and multi-link rear suspension that is responsible for smooth and jolt free riding experience. It provides you a turning radius of 5.5 metres and maximum ground clearance of 200 mm. Lookwise, the SUV its treat for eyes. In its hood, it possess a big body coloured bumper, a wide grille with the company's insignia in the middle and distinct multi-reflector, halogen projector headlamps. Grand Vitara also comes with general headlamp and front and rear fog lamps. The company does a good job in interiors. Enough leg and headroom space for driver and passengers. The drivers seat is electronically adjustable. The dashboard comprises of 6 CD-changer and common features in bold and clear vision. The vehicle also possess automatic climate control, power windows, power steering wheels, central door locking and remote controlled door locks.